Unless you store your boat in the water year around, which you shouldn’t be doing in Minnesota, what good is a boat without a trailer? You’ve got to be able to transport your boat to and from the lake, and the most ideal way to do that is with a trailer. Now that it is the winter boating off-season, have you taken a look at your trailer to ensure that it didn’t experience any damage in 2015? Boat trailer repairs are often put on the back burner because you are so focused on your boat. However, your trailer is what protects and transports your boat from the lake, so it is vital that it is properly functioning. The last thing you want to happen is for your trailer to malfunction, which in turn damages your boat. How’s that for a double whammy! Take advantage of these cold months and let our boat repair experts at Anchor Marine Repair in Minnesota evaluate your boat trailer today for free. Boat trailers have an important job. Not only does this unique equipment transport your boat to the lake, but it also releases your boat into the water. In order to get your boat into the water, the trailer itself must submerge into the water as well. This repetitive process can cause your trailer to rust and corrode over time. Anchor Marine Repair is committed to providing some tender love and care to your boat trailer to ensure that there are no electrical, mechanical or bodywork issues that need to be addressed. Our experienced staff will evaluate every inch of your trailer from the tires to the brake lights. Don’t forget about the piece of equipment that will be transporting your boat to the water this spring. Although getting your boat repaired during the winter may be high on your to do list, don’t overlook your trailer repair needs as well! 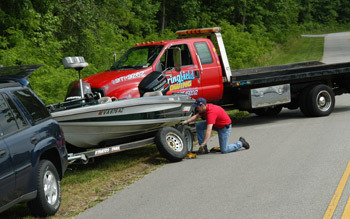 The best time to repair your boat trailer is now, when you’re not going to be using it. That way you are ready to get back to the lake safely come spring! Put your trust in Anchor Marine Repair today for all of your boat trailer repair needs. If you live in Minnesota or Western Wisconsin, give us a call today at (763) 972-3540 to set up a free estimate with one of our trailer repair specialists.